New academy for Tameside LEP accommodating over 1800 pupils and staff together with a new Special Educational Needs (SEN) school for 100 pupils and staff, co-located on the same site. The academy incorporates a large auditorium with stage, 4 court sports hall with separate activities hall and dance studios, a hydrotherapy pool, as well as traditional classrooms, laboratories, open teaching areas and dining facilities. Waterman was appointed by Carillion to carry out civil and structural engineering, including highways engineering on this £23m educational facility. In partnership with Carillion, Waterman helped to deliver 7 new schools in total for Tameside LEP under the former BSF programme. The three storey building is connected at 1st floor by an internal bridge link across the service road to the neighbouring Samuel Laycock SEN school which sits above on a higher plateau. This allows the SEN school to share some of the academy facilities, such as the hydrotherapy pool. The SEN school has its own teaching spaces, laboratories and dining facilities. Externally, both schools have floodlit all weather synthetic grass pitches and MUGAs, together with traditional grass pitches and running track. Both schools share the large car park and bus drop off facility. A CHP plant provided power to both schools. The schools were awarded BREEAM Excellent accreditation. The schools are built on the site of a former colliery and deep landfill. Extensive ground investigation was required to locate former mine workings and to determine the extent of the domestic landfill (up to 23m deep) and monitor any ground gas production. Four mine shafts were located and treated and a ground gas exclusion curtain with vent pipes installed around the perimeter of the landfill to protect the schools and surrounding housing from ground gas migration. Former colliery spoil found on the site was tested for suitability and reused as engineered fill. 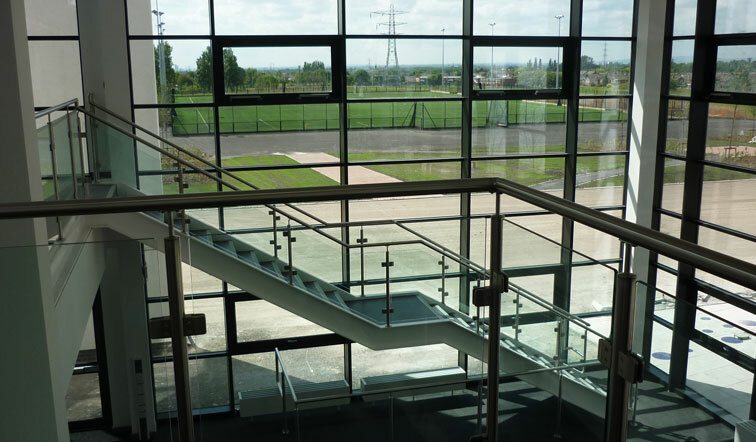 An unusual feature of the academy is the sports hall and activities halls which are located at 1st floor directly above the kitchen and dining area which is a column free space. The long span floor structure had to be carefully checked for floor response to ensure adjacent classrooms were not affected by induced vibrations. Walkways were also hung from the roof to avoid columns at ground floor. Another unusual feature was the link bridge between the two schools which was tapered on plan, fully enclosed and heated in order to be used as an additional teaching space by the SEN school.